We recently had a Nissan Skyline GT-R that ran great at idle. Would pull smoothly through the gears, but at high rpm, and high load would break up. The first thing we thought to check was the spark plugs, and ignition coils. Since the idle was smooth at 1000 rpm, and it didn't sound like it had any vacuum leaks, this seemed the first spot to start troubleshooting. When the coils came off, there was a bit of dirt/carbon on the coil packs and boots. Dirty coils can cause misfires. Electricity can conduct through the dirt and carbon build up. We cleaned up the coils, boots, and added some dielectric grease to them. Once we removed the boots from the coils, we noticed one missing contact. About 99% certain we had identified our issue, we put it back together to test. A short drive later, problem solved. Lots of vehicle issues can be identified and fixed, with just some observation, and a little bit of work. 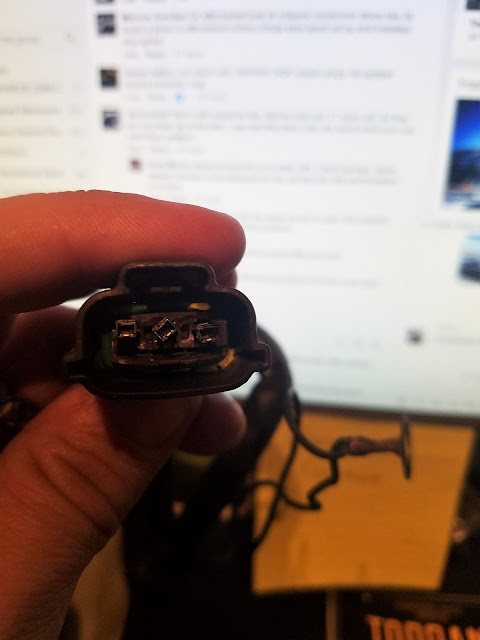 From loose electrical connectors,loose grounds, broken solder joints, to small parts missing. On vehicles over 25 years old, things will come up. Before randomly buying new parts, and replacing them, spend just a little time troubleshooting to at least narrow down the issue. Back to the ignition, coils, wires, etc. The first thing to do, if you think you have a misfire, or problem with your ignition system is to observe. 1) Does the car have a noticeable miss? Shaking a little, won't rev up correctly? An RB26 should idle pretty smoothly at 950-1050 rpm. 2)Can you rule out anything obvious? Aka vacuum noise, vacuum lines off, intercooler hose popped off, electrical connections disconnected? 3) Remove center plate from engine - finishing plate, so you can access coils. 4) Reconnect igniter. Start engine. Disconnect one coil at a time, to isolate cylinder that is misfiring. If you notice no difference, then double check them all. There is another way to do this with Consult software, but standing in front of the engine, its normally very obvious which cylinder has little to no change when disconnected. 5)When you locate the misfire, turn off engine. Pull that coil and plug. Double check all connections. 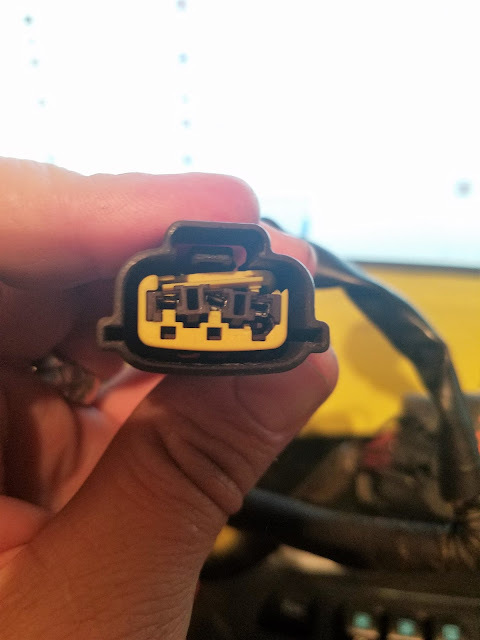 Is the connector damaged? Any signs of overheating on the coil? Is it dirty? Do you see a large amount of carbon? Check the wiring harness. 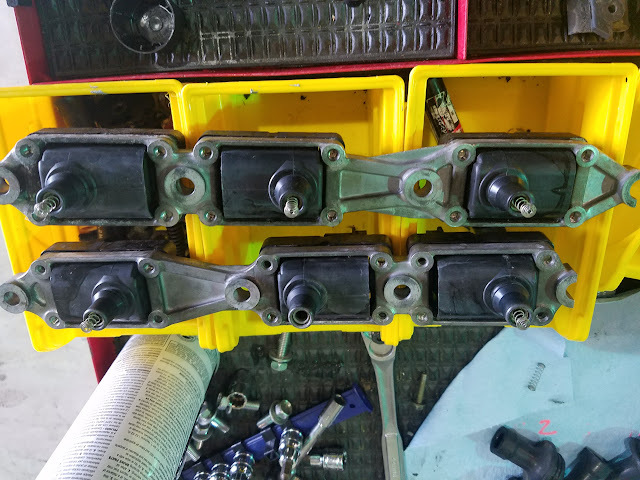 Any loose or broken connectors? 6)Pull the coil boot off, look at the contact. There are two styles of contact, a carbon, and a spring. The carbons wear, the springs can also fall out. Make sure something is there, and doesn't look corroded, or damaged. Notice anything missing? High boost, and RPM misfire identified! 7)Pull the spark plug out and look at it. Does it look normal? Does it have wet fuel on it? Is it missing an electrode? 10) Fire it up, see if that fixed it. 12) If the car is an R32/R33 then it has coil, igniter, wiring harness, ECU, power to fire the coils. If the car is running, the power is good, so don't bother look at the main power. That narrows it down to coil, igniter, wiring harness, ECU. 13) Next thing to try, is figure out if the coil is bad. Take the coil that showed as misfiring, and move it to another cylinder. AKA #2 was bad, move it to #3, or #1. Doesn't matter where. Did the misfire follow that coil, or is it still showing same hole as bad? 14) If the misfire followed the coil, then its probably a bad coil, replace, test again. 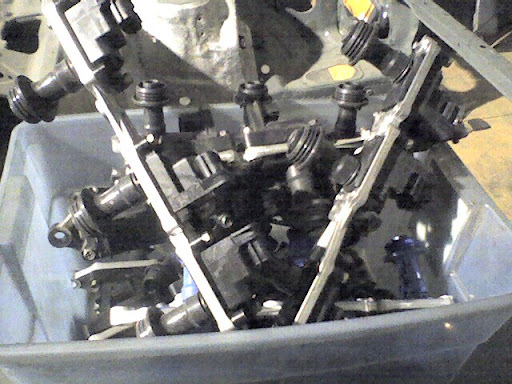 15) If the misfire stayed in the same location, then its either wiring harness, igniter, or ECU. Could also possibly be bad plug. Swap plug, test again. 17) If this doesn't fix it, the next step is isolating the wiring harness, the igniter,and the ECU to figure out which component isn't working.